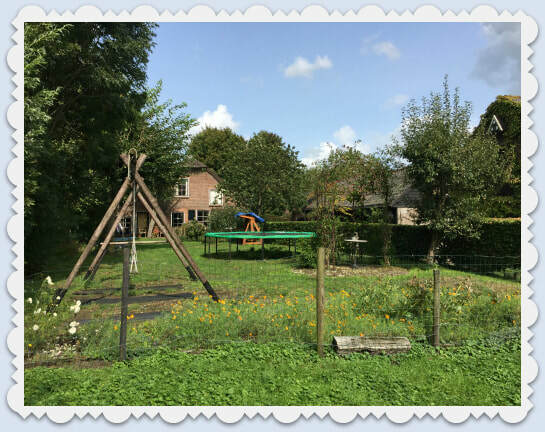 In the country side, in the environment of cities like Amsterdam (65 km, direct train connection), Utrecht (30 km), Rotterdam (30 km) and Gouda (10 km), surrounded by extensive green meadows, characteristic villages and small medieval towns, you will find our pleasant, (grand)child friendly, B&B. 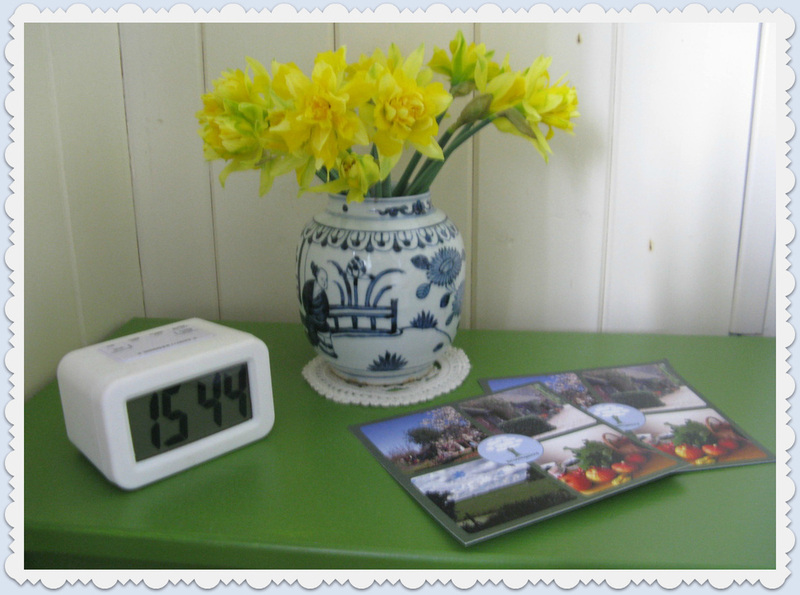 We receive our guests in the Voorhuis (four people) or the Garden room (two people). The Voorhuis was the traditional living area of the farmer and his family. Together they lived there on a small space that was used optimally. Above the cheese cellar you will still find the “opkamer” with the cupboard bed. The living room has a broad view over the dike and the small stream the Vlist. Nowadays we provide you there with all sorts of amenities like WiFi, a small fridge, a coffeemaker and a small micro-wave. In addition there is an ancient glass cupboard and in various cupboards you will find toys for the (small) children and some games. There are magazines available and information of the surroundings and nearby activities. In this room we also service the breakfast, we have a dinner table a sofa and a grandfather´s chair to relax. 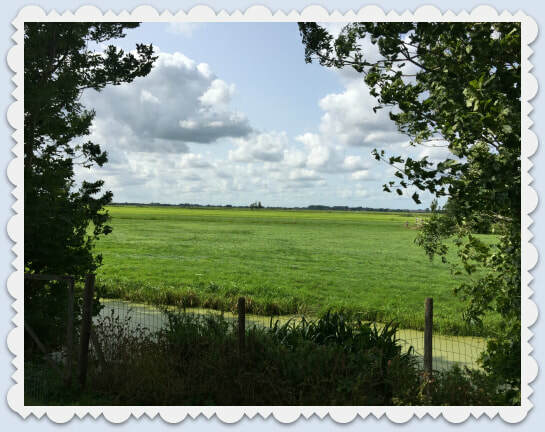 From this room you have a view over the dike to the river Vlist (small) and the authentic farm on the other side. The breakfast consists of cooked eggs of our own chicken, local cheese, and everything else you would expect including nice rolls and pastry. The use of our kitchen next to the living room is possible. 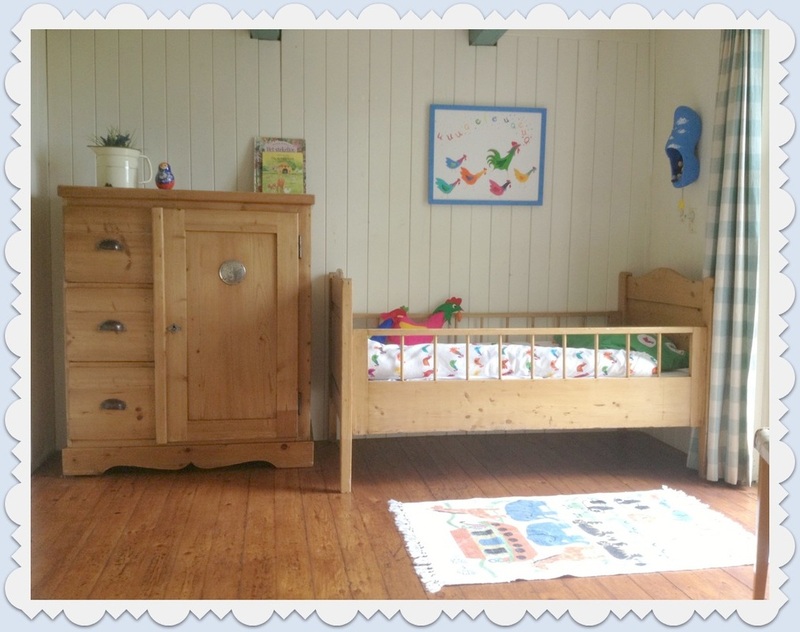 children´s bed (max 130 cm) or on request we can provide with an adult bed. There is also a baby bed available. The star catcher in the “wooden shoe” will supervise you during your sleep! The other bedroom provides room to two persons. 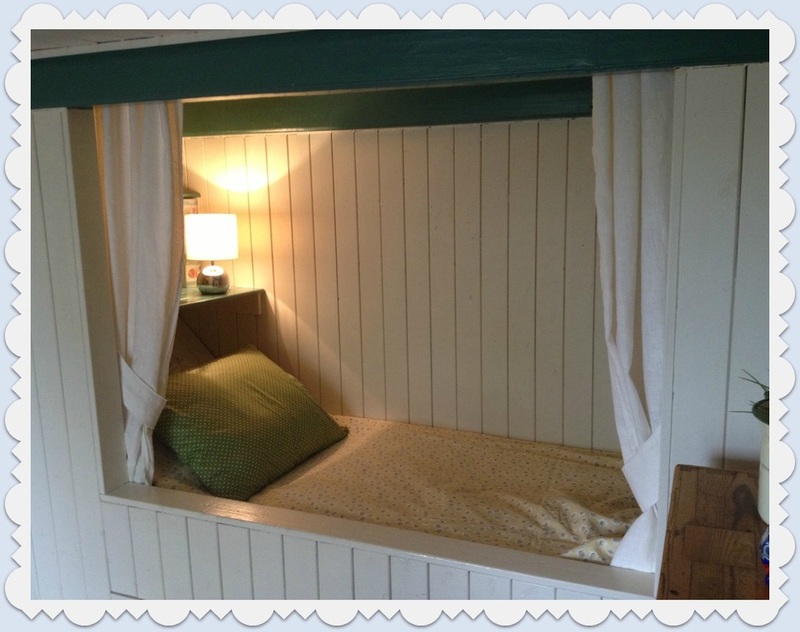 There is a comfortable two persons bed and there is space to store your belongings. 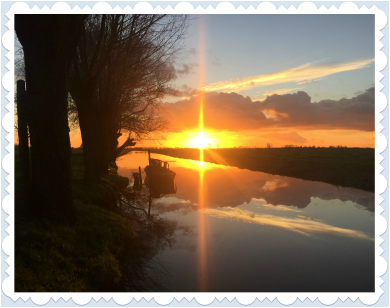 The view over the “polder” and the silence you will experience here arranges for a good night rest. As a guest you will receive a key of your own entrance to the farmhouse. In addition the whole area has WIFI. The shower and toilet are in the corridor next to the rooms. The bathroom is rather small but sufficient. The shower has a small step and a glass sliding door. 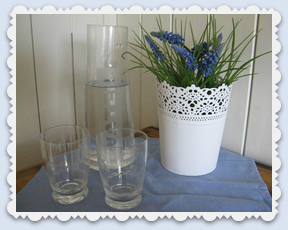 Above the washbasin you´ll find a retro bathroom cabinet and shower gel, shampoo and conditioner is available. The toilet however is spacious and provided with a small sink. The Garden Room is located on the first floor on the South-West corner of the farmhouse overlooking the garden and orchard. It is a large room of approx. 25m2 with an authentic wooden floor. The room has a kingsize double bed (180 cm wide), a comfortable couch and a dining table. The bathroom/toilet is on the same floor and shared with the owner. In the room there is radio/DVD,TV and wifi available. 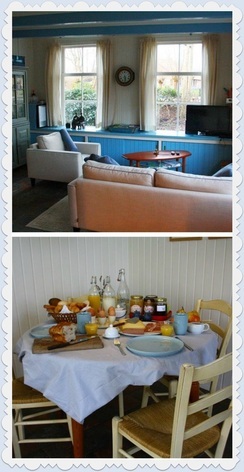 The breakfast in the morning will be ready for you in front of your room in an old fashioned bread basket.. 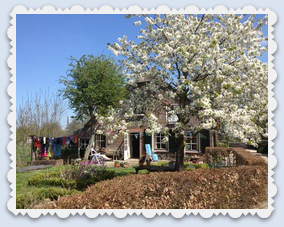 The Droomgaerd provides all necessary comfort also for our small visitors and we hope your stay will be a great success. There is a large sand box with tools, a great swing and lot of toys. Furthermore there is an old fashioned child chair, a triptrap and a child box. For the very small guests we have an old light blue Van Delft baby carriage. ​In spring and summer it is very nice to sit or walk around in the garden. If the weather permits we are pleased to service your breakfast outside.